Hello - Thanks for Visiting our specialist Jaguar XK8 / XKR Parts and Accessories website. Ever since I was a young teenager way back !, my family circumstances required that if I was to ever own a motorbike, car or boat then I would have to look after this completely myself as opposed to taking this to the local garage and paying to get the job done. For my part, this necessitated the purchase of workshop manuals, tools, overalls and the required parts to do the jobs myself. There were quite a few mistakes on the way to say the least ! but I became more proficient over the years and when it came to my eventual passion for Jaguars I was able to generally maintain my cars myself at reasonable cost. If I was’nt able to do the job myself, I could talk credibly to Jaguar specialists who seemed to appreciate my understanding of problems and how to resolve them. This promoted a keen interest in the Jaguar Parts market as often after a search I would buy the required parts and these could then be either fitted myself or by a Jaguar specialist. This has saved me a lot of money over the years. As far as Jaguars go, I’ve had quite a few over the years notably; Jaguar 240, Daimler XJ6 4.2. Jaguar 3.6 XJS, Jaguar MK2 3.8 and my current car's are a 2001 facelift Jaguar XK8 / X100 and a 2006 New XK / X150. 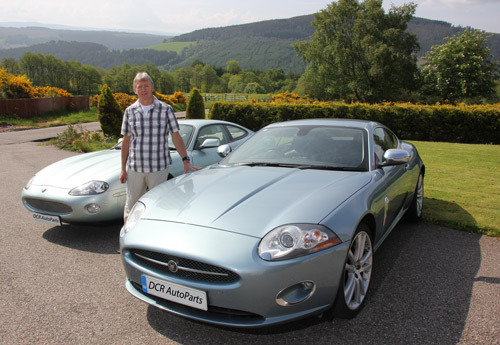 Both of these equally are the best of all the Jaguars I have owned combining great performance, reasonable economy, reliability and fantastic looks. The purpose of this website is to provide best advice and guidance on Jaguar XK8 and XKR Parts and Accessories availability together with providing technical information on maintaining your XK8 and XKR car. We can supply Genuine Jaguar, OEM and aftermarket parts and accessories at fair prices. Where new parts are not available we can check our growing stock of used parts. On a regular basis we will feature the very latest XK8 / XKR parts and accessories to further enhance the look and performance of your Jaguar. Distance is no object, we have shipped parts and accessories to the far corners of the world ! In the future, we will provide the facility to purchase parts online via a shop. In the meantime please contact me preferably by email and I will respond as soon as possible.